What Does Code P0046 Mean? 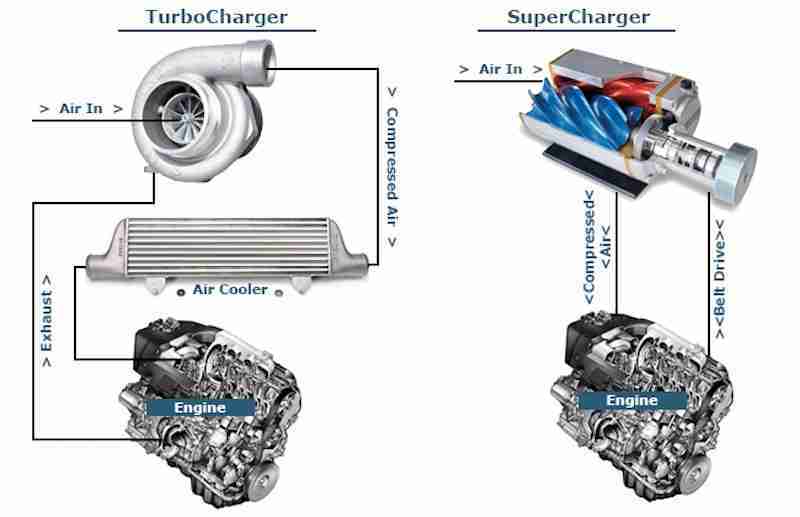 Although both the turbocharger and supercharger are forced air induction devices, they are very different in design. The turbocharger utilizes engine exhaust to generate turbine operation. A specially designed exhaust manifold (or manifolds) allows spent engine exhaust gases to enter the turbocharger on the turbine side. On the opposite side of the turbocharger there is an impeller housing which is mated to the engine intake manifold via aluminum or silicon hoses. This design permits the turbocharger to capture hot engine exhaust gases, compress them under high RPMs, and reintroduce them to the engine as forced air induction. Most turbocharged vehicles are also equipped with an air or cold water intercooler. In order to introduce cooler, denser air into the engine, high-pressure air from the impeller is forced through the intercooler before entering the engine. The intercooler is typically located in front of the radiator or air conditioning condenser so that ambient air may flow through it when the vehicle is in motion. 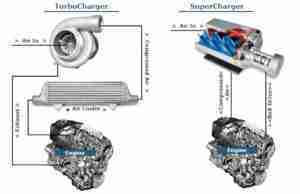 Superchargers are a bit more complex in design than the turbocharger. There are two popular supercharger setups. The first is a roots-type supercharger. This type of supercharger is bolted to the cylinder head/s in place of the intake manifold. It functions as the intake manifold with one exception; it also has a compression device that includes roller-type pistons. The roots-type supercharger is belt-driven using the engine crankshaft. The second supercharger design is a centrifugal supercharger. It is typically bolted to the face of the engine with specially made brackets and bolts. This type of supercharger is also belt driven using the engine crankshaft. It is designed much like an air conditioning compressor and uses rolling pistons to compress air that will be forced into the engine combustion chambers. These types of compressors are usually aftermarket components and require a stand-alone boost controller that interacts with the factory PCM. Because of the nature of turbocharger and supercharger operation, as engine RPM levels increase, so do the RPM levels of the respective device. Most forced air induction devices don’t even begin to effect engine performance until the 2,000 RPM range. These forced air induction devices can reach internal RPM levels of 250,000 under peak boost conditions. Of course, these extreme RPM levels can produce air pressure that is far higher than that of atmospheric pressure. This compressed air is known as “boost pressure”. Turbocharged and supercharged vehicles use forced air induction to increase engine performance. These types of vehicles are often equipped with smaller engines. The introduction of a turbocharger or supercharger permits these smaller engines to perform at a level comparable to that of a much larger engine. These vehicles require a very particular fuel delivery and engine drivability strategy. The PCM is programmed for increased fuel delivery, higher engine temperatures, and turbo boost pressure regulation. Because of the possibility of engine damage that may occur from excessive boost pressure, it must be regulated using a wastegate or a bypass valve. Excessive boost pressure is relieved by allowing it to either vent into the intake system or a specially designed reservoir; until it can be gradually reintroduced into the engine intake system. The turbocharger/supercharger bypass valve may be an electronically controlled solenoid that actuates the opening of the bypass valve. When the PCM detects an overboost condition, a voltage signal is applied to the bypass control valve solenoid and it is opened, allowing excessive boost pressure to escape. It may also be a vacuum operated valve that is actuated via an electronic vacuum control (or vacuum service) valve (VCV). The VCV is supplied with constant engine vacuum and battery voltage. When the PCM applies a ground signal to the VCV, the solenoid is opened and engine vacuum is allowed to reach the bypass valve. When vacuum is applied to the valve, it is opened and excessive boost pressure is allowed to escape. What are the common causes of code P0046 ? What are the symptoms of code P0046 ? How do you troubleshoot code P0046 ? A Range/Performance related code will be set when either a sensor or other component does not perform within the range the PCM (Powertrain Control Module) expects to see, given the current engine load/speed, and information gathered from other sensors. The possible causes of Range/Performance codes are likely to be defective sensors as easily as they are likely to be the result of wiring issues that affect the operation of the affected sensor or component, which means that with these codes, it is important to regard all sensors and components as part of the control circuit the code refers to. I would begin my diagnosis with a careful visual inspection of all related wiring, connectors, components, and vacuum hoses. Repair or replace damaged, burnt, or disconnected parts as required. Also, check battery cable and battery post condition. Carefully rectify loose or corroded battery connectors and/or terminals before proceeding with your diagnosis. Continue by noting all stored codes and freeze frame data before clearing all codes from the system. Clearing the codes may allow the turbocharger/supercharger boost control system to return to normal operating conditions if the PCM placed it in a failure or “limp-in” mode. It may also make you aware of an intermittent failure condition that will be much more difficult to diagnose than a “hard” failure. After obtaining specifications for the boost control solenoid, disconnect the solenoid electrical connector and use a digital volt/ohmmeter (DVOM) to check solenoid resistance levels. If solenoid resistance fails to comply with specs, replace it and retest the system. If solenoid resistance complies with the specs in the service manual, carefully apply battery voltage and a ground signal to the solenoid and listen for an audible “tick”. If the solenoid makes a sound, it is likely functioning properly. 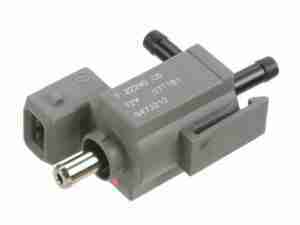 Check the passages of the solenoid for signs of obstruction and replace as necessary. If system wiring and connectors appear to be in proper working order, perform a circuit voltage and continuity test. Test voltage at the boost control solenoid when it is commanded ON and compare your actual findings with manufacturer’s specifications. If the signal fails to comply, establish which of the signals (voltage or ground) are absent according to your particular vehicle specifications. Prior to testing for individual system circuit continuity, disconnect the connector from the PCM and all related components to prevent possible damage. Use the DVOM to test continuity on each individual circuit and repair open (disconnected, cut, burnt, or disconnected) circuits and shorted (to ground or vehicle voltage) circuits as required. While testing the PCM is not feesible, you may follow a process of elimination and remember that failure of this component is rare. None found. Ask a question about P0046. Just got this code on a 2001 GMC Sonoma 4.3L. I do not have a Super or Turbo Charger. What would I change for this code? In my experience with this situation, I have found PCM programming errors to be the culprit. It could also be a faulty PCM.